Nature is a closed-loop system. Every piece of every organism on this planet can be completely consumed and used by other organisms. Every piece of feces that comes out of an animal and every gas that is released by the leaves of a plant is fodder for other species. Humans are the only species on this planet that produce true waste: materials that nature does not have the ability to break down and use. A great visual representation of that waste and the impact that it has on nature is the video below by Chris Jordan. The video is a preview for a documentary titled “MIDWAY” about the pacific island of the same name where albatross are being killed by our plastic waste. 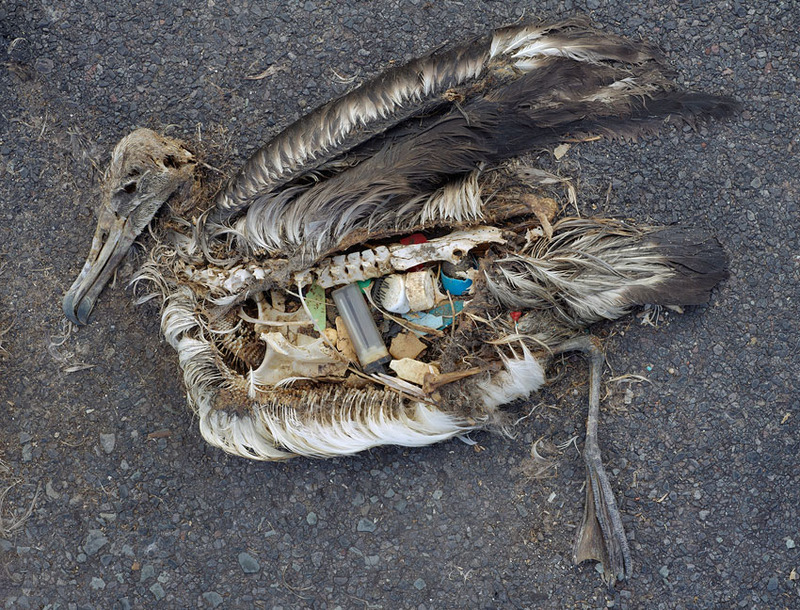 An albatross that died of hunger with a stomach full of plastic. Photo: Chris Jordan. The source of the plastic is one of the two Pacific Garbage Patches – massive ocean areas where currents cause the accumulation untold quantities of plastic from on- and off-shore pollution. According to the National Oceanic and Atmospheric Administration (NOAA in the United States), there is no “accurate estimate on the size of mass of the ‘garbage patch'”. However, the clip from MIDWAY shows that its impacts are quite real. Again, quoting from the NOAA website: “regardless of the exact size, mass, and location of the ‘garbage patch,’ manmade debris does not belong in our oceans and waterways.” And it certainly does not belong in the stomachs of birds. I agree. One of the people involved in the Midway project wrote on their website that Midway (and places like) isn’t a problem of waste disposal, it is a problem of design. We can no longer afford to design products that cannot be broken down or completely recycled (as opposed to downcycled). And we need to stop dumping our waste in the ocean! I shared this on my Chime.in (earthstonestation)page Joce. I’m expecting the Japanese tsunami debris to start washing up on Hawaii shores later this year. It ain’t going to be pretty. Oh my. That is going to be quite the problem for you folks. Do you know if there plans in places to deal with that debris? Not that I have heard of. Most stuff comes in at South Point at a place called trash beach. Clean ups occur with volunteers but the area is remote and not easy to get to. I’m monitoring the situation. Fortunately no radioactive stuff is expected. That image of the albatross just breaks my heart.